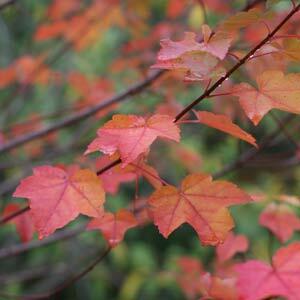 Acer Rubrum or ‘Red maple’. With many species and cultivars of Acer Rubrum available the choice for this outstanding feature tree is wide. Best suited to planting where its attractive natural growth habit can be appreciated, this is a wonderful specimen or small shade tree for larger gardens and parks. Also suited to planting in avenues on larger properties, or for street planting. Grown for the outstanding red foliage in autumn, Acer rubrum varieties will reach around 10 – 15metres in height depending on conditions. Upright habit at first, with a broader crown on mature specimens. Useful in landscaping as it does tolerate damp soils. Reaches 10 – 15m depending on conditions. Requires some water in very dry conditions especially in hot windy areas. Once established it is reasonably resilient. Family run business selling advanced ornamental trees including 9 varieties of Crepe Myrtle, Maple, Birch, Ash, Ginko, Crab Apple, Ornamental Plum, Weeping Cherry, Oak & Chinese Tallow. Wholesale prices to the public. Deciduous and evergreen trees and shrubs. Flowering, Fruiting and Ornamental. Bare root and containerised 20cm to advanced. Strictly wholesale.